Georges St-Pierre might be interested in fighting again but it won’t be against Nate Diaz at UFC 227. UFC president Dana White had stated just recently that he was trying to put together a fight between St-Pierre and Diaz for the upcoming card in Los Angeles on Aug. 4. 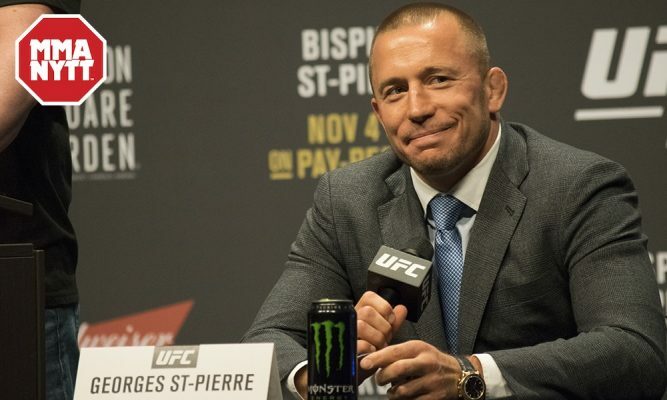 While St-Pierre confirms that the fight was offered to him, the former UFC welterweight champion ultimately decided that it wasn’t the right matchup for him not to mention that he’s still suffering the ill-effects of a bout with ulcerative colitis that forced him to surrender his middleweight title last year. “I just turned 37 a few days ago. I don’t have much left. For what I have left, I want to make the big fight,” St-Pierre told Joe Rogan on his podcast on Wednesday. “The fight that fans want to see. I also want personally for me to achieve something that is unique, that is rare. That maybe never been attempted before. That would be something that excites me. The proposed bout would have seen St-Pierre drop down to lightweight to challenge Diaz, who has competed at welterweight for his two most recent bouts against Conor McGregor. St-Pierre has history with Nate’s older brother Nick Diaz so the story was already embedded before the fight was even put together. That being said, St-Pierre just didn’t see that there was much to gain from fighting Diaz versus holding out for a bigger matchup if and when he decides to compete again. “Nate Diaz is an incredible fighter, very well rounded. However, if you put yourself in my shoes, there is nothing good that can come out of it except money. And money is not the only thing that drive me,” St-Pierre said. “If I beat Nate Diaz decisively, most people will say, ‘Oh, he took an easy fight. Oh, he’s a bully.’ He’s a big guy. He’s about the same size as me, but because I compete at 170 [pounds] for most of my career (and won the title at 185), it will make me look bad. It will make me look like a bully. While St-Pierre says he definitely entertained the idea of fighting Diaz, a conversation with his coaches ultimately led to his decision to pass on the matchup and wait for something bigger down the road.